Phil, from Black Blue & Gold, tossed out a Tweet linking to Ray Bishop’s Facebook post of Ryan Miller’s brand new paint job. Miller’s masks have long featured some sort of take on the head of his team’s mascot or logo. 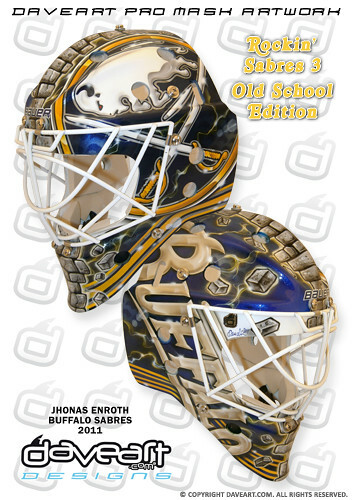 Perhaps the coolest thing about the evolution of his helmet was the way he and Bishop had worked together to transition the design of the goathead logo into the era of blue and gold. However, Phil’s Tweet helped to unveil Bishop’s most recent design for Miller. I can’t say I hate the look of Miller’s new helmet. It fully embraces the white buffalo used in the Sabres’ logo while incorporating many of the traits that have come to define the iconic mask he has been wearing for years. The elimination of the old styling consistent with the goathead in favor of an all white buffalo head. There are hints of blue in the fur and the horns have a gold tint to them, tying the two to Buffalo’s color scheme. What I love about Miller’s new mask is the inclusion of the third jersey script, crossed sabres and the charging buffaloes. Bishop did a phenomenal job tying those three pieces into the mask. 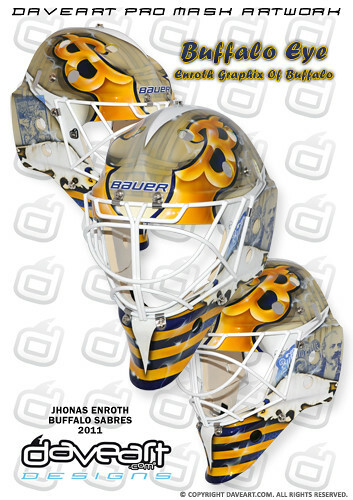 The new design elements blend better than the look of Miller’s old Sabres masks. 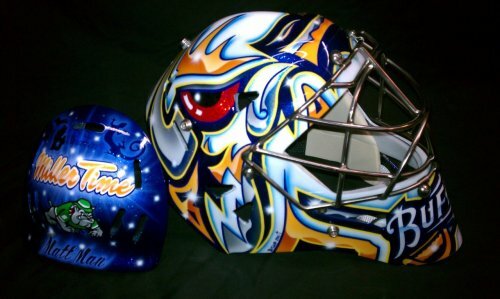 Previously, the bottom portion of Miller’s mask was a stark contrast to the stylized design of the top. The new design, while contrasting, has much better flow with the inclusion of both logos that appear on each Sabres uniform. I’m looking forward to seeing Miller roll out the new mask. However, I would assume he will hold off due to the impressive run he has been on recently. Jhonas Enroth also rolled out a new helmet in recent weeks. While it isn’t as totally awesome as Miller’s new lid, it still has some really awesome features to it. It took these two new helmets for me to realize a pretty cool fact. The Sabres goaltenders use the two best mask painters in the game today. Enroth and his artist, Dave Gunnarsson went in a drastically different direction from his previous masks with this most recent design. Enroth’s old design was a very cool two-sided split look with both the classic crest and Buffalo script logo. Enroth had used this design since coming to North America. The new design is a take off Felix Potvin’s legendary Toronto mask with a pair of script ‘B’s acting as eyes and charging buffaloes on the bottom portion.The blue and gold stripes on the chin are an interesting take that adds a bold look to the chin of the mask. 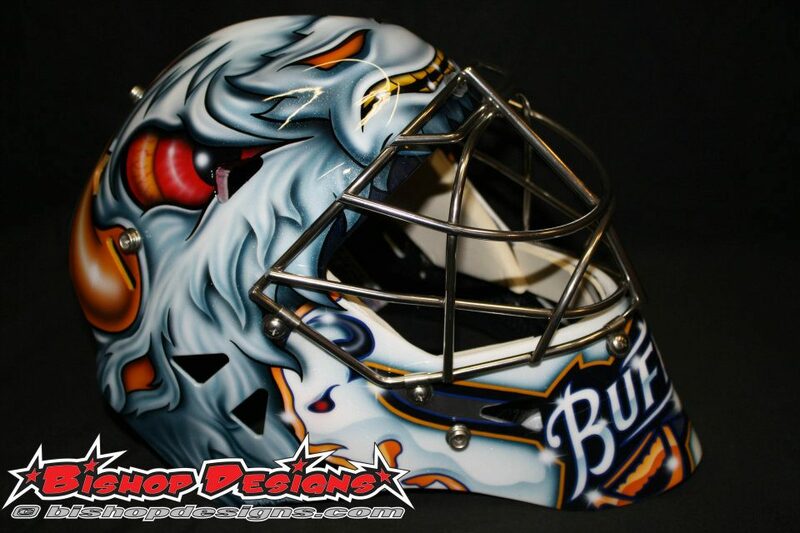 The stripes are quite similar to what is featured on David Leggio’s awesome new mask (also from Gunnarsson) too. I like the stripes best for two reasons. First, it is a very different look that is more reminiscent of masks from the 90s that used more basic designs (think Patrick Roy in Montreal) than the complicated pieces of art worn today. Also, the stripes are a bold contrast to the very artistic top portion. Of both new masks, the only thing I don’t love about Enroth’s mask is the inclusion of Buffalo Bill Cody artwork. Cody doesn’t have much of a tie to the region and none to the Sabres as a team. Cody’s name is inspiration for the Bills, but had nothing to do with the city. The pillar from city hall on the forehead is pretty cool, but doesn’t necessarily translate on the mask. Overall, both masks are huge wins in my opinion. Even if both goalies save them for next season, it will be cool to see the new artwork in action. Now if only I can pull the coin to get either Bishop or Gunnarsson to paint one of my helmets.